People think of getting an aquarium and immediately just focus on the actual fish tank and the fish. Okay, to be fair, those two are pretty much the main components of any aquarium. So whether you want a standard 29 gallon aquarium, a bigger 75 gallon aquarium or one of those strange and unique fish tanks, it’s almost a given that searching for an aquarium for sale will just be about the tank and the fish. That is until you have those items and realize that it doesn’t really look as complete as one would initially think. One of the aspects of aquarium keeping that’s often overlooked is the lighting. It’s unfortunate when that happens because aquarium lights is actually one of the most basic things a fish tank owner and pet keeper need to have in there. Why are lights important to your aquarium? If you have live plants, lights provide vital energy so photosynthesis can take place. It’s the primary light source for a tank with photosynthetic organisms (including corals and animals). It influences the over-all health and physiology of the fish in the tank. It allows the pet owner to observe the tank and everything in it. 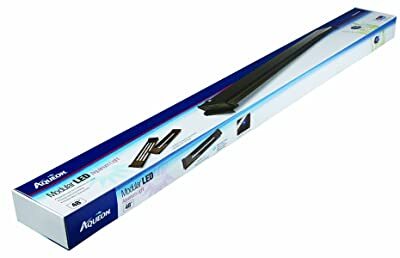 Unfortunately (or fortunately, depending on how you look at things), now that technology has made huge advancements, aquarium lighting has also become a bit more complicated than just simply buying any bulb. So here’s a quick guide to help you. First and foremost, you need to identify what the lighting is for? Aesthetic lighting will bring out the vibrancy of the fish color. Since this is concerned with how everything in the tank will appear under the light, you need to look at the CRI or Color Rendering Index of the bulbs you’re getting. The CRI scale goes from 0 to 100, with 100 signifying how objects appear under natural daylight conditions. Of course, higher CRI values don’t always mean getting the best color to show. Sometimes, color-enhancing bulbs are actually better in getting richer colors out of the aquarium inhabitants. You also need to look at the color temperature of a bulb (Kelvin rating). Lights that are more for function, meanwhile, are there to support photosynthesis by providing the vital energy needed for it. As long as you have live plants, anemones and corals in the tank, you need functional aquarium lights. That means being concerned about bulb intensity and wattage. 1 to 2 watts of lighting per gallon of fish-only tanks. 2 to 5 watts per gallon for freshwater planted aquariums. 4 to 8 watts per gallon for reef aquariums. There are also many different kinds of light bulb and fixtures depending on your set up. This is the easiest way to light up a fish tank and is good for fresh and saltwater aquariums that contain only fish. 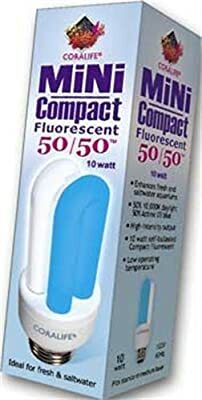 50/50 or actinic white bulbs. 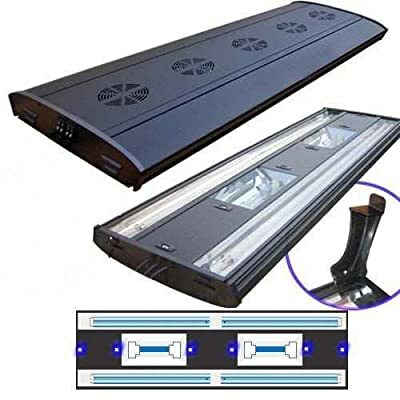 Generally has higher light output compared to standard fluorescent bulbs. This type also consists of dual or quad bulbs for higher light output. It’s a good space saver and easy to operate. Recommended for advanced hobbyists, metal halide systems have high intensity discharges. They’re ideal for reef set ups that need high lighting conditions. Whatever you decide to go for, here are a few samples of what’s available in the market. One Day White LED with expansion slots for 2 additional easy-to-install LED lamps. Moisture-resistant plug and play connections. With pre-installed, adjustable mounting legs. 3-position power switch: day, night, moon glow. Dimensions: 48 x 1.5 inches. This standard light fixture is manufactured by Aqueon and is available in many different sizes. It’s an energy-efficient and can be hooked up to a timer. It also comes with a 3-position power switch, day (right), night (left) and moon glow. Ideal for fresh and saltwater aquariums. Dimensions: 6.5 x 1.6 x 1.8 inches. This bulb is manufactured by Coralife, which is a known brand in aquarium supplies. The bulb itself is a combination Colormax and 6700K Daylight that will be awesome in showcasing the colors of freshwater tropical fish. The nice thing about it is it also uses very little electricity and doesn’t generate a lot of heat. It’s very bright, though, so be warned: anyone who doesn’t want to be in the light will have to be given a dark hiding spot. May be set up with timers for dusk effect. Highly efficient electron ballast included. Weight: 55 pounds (shipping weight). Manufactured by Aqua Marine, this metal halide compact light fixture generates 560 watts and is highly efficient. It’s a bit pricey for a novice aquarium owner but a steal for hobbyists with more advanced set ups. Read more: How to Choose a Good Lighting System for Your Aquarium.